Terrific backyard hybrids! Want a chicken that will sit in a swing with your children? Have their toe-nails painted? Be cradled like a baby? 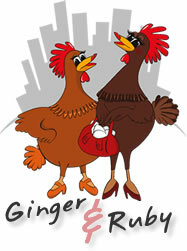 Well then, Ginger and Ruby are so ‘eggs-cited’ to introduce themselves. Ginger is an Isabrown and Ruby is a Loman Brown. Both are believed to be hybrid crosses between a Rhode Island Red and Leghorn or New Hampshire and grow to a height of about 30cm. Our Isabrown chickens come from breeders who really care for their girls and are vaccinated and wormed, as per Dept of Primary Industries standards. We then cuddle them and get them ready to be passed on to families wanting a content, lovable, cheeky family pet. Isabrowns appear to be the most popular type of backyard chicken as they are renowned for their high laying capacity – up to one egg per chicken per day, depending on the season. They also don’t like flying much and it takes a lot to get them excited, so they’re perfectly suited to life in an urban backyard. Saying that, they can jump onto and over a fence with a top ledge up to 1.5m high if there is something really yummy on the other side. We also supply the stunning Black Australorp Hybrid and the classic White Leghorn Hybrid. Both have been crossbred with the Isabrown to get the best from both breeds with regard to egg laying, low levels of excitability and beauty. Why choose a PURE BREED? Well, with so many families choosing the convenience of the daily egg laying hybrid, the pure breeds are not as much in demand anymore and so breeders are becoming scarce. Pure breeds can be broody and go off the lay. But, what we love about these birds is the range of colour and personality. For bantam chicken lovers, we can source stock of Silkies, Pekin Bantams and the crinkly Frizzle Pekin Bantams when in season.